PowerHouse Systems has developed and deployed a balun based panel that can support both E1 and T1 transmissions which make for easy patching. Some companies offer two different panels for these applications but after exhaustive testing with some of the largest telephone companies in the world we have proven and perfected panels that handles 120 ohm and 100 ohm interfacing with 75 ohm coax, or 120 ohm to 93 ohm RG62 , 100 ohm to 93 ohm RG62 , and 120 ohm : 50ohm and 100 ohm : 50 ohm over RG58. While there are different tolerances for E-1 120 ohms (+/-15 ohms) and T-1 runs at 100 ohms (+/- 10 ohms,) Transmission Return Loss is the critical performance spec that reflects the characteristic impedance mis-matching. We have proven that a 10 or 15 ohm tolerance of impedance creates just miniature deviation of the transmission Return Loss. Worst case we could expect a Return Loss of 14 db which is acceptable to most all transmission systems. 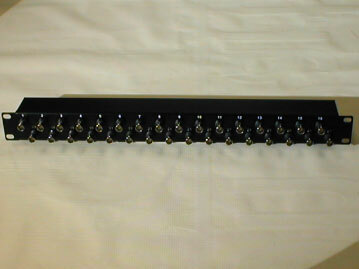 Inline E1/T1 Panel - This panel has fully shielded RJ45's and is loaded with 24 ports of complete inline pin to pin wire management for instant patching on your rack. 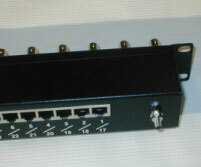 These panels are also available in Cat 5e and Cat 6 feed through if higher bandwidth performance is required. 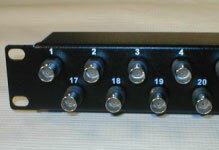 We can develop your custom E1/T1 panels and Connectivity. We welcome your OEM challenges today. Contact PowerHouse Systems for more information on how to beef up your E1/T1 management. Copyright 2004 Power House Systems Inc. All rights reserved.